On July 27th, Microsoft announced their Integration Platform as a Service (iPaaS) offering, Logic Apps has reached General Availability (GA). The GA release includes additional management support such as workflow run details, telemetry events and alerts. As part of this release, Microsoft has also provided consumption-based pricing details. The Logic Apps journey to the cloud began back in 2014 when Microsoft introduced Azure App Service at the Integrate 2014 conference. Since then, Microsoft has provided a public preview in March 2015, a Public Preview Refresh in February 2016 and now the GA release. Logic Apps is seen as a complementary technology to Microsoft’s on-premises integration platform, BizTalk Server. Late in 2015, Microsoft provided a holistic Integration Roadmap, which included both of these technologies. The Logic Apps GA release hits a Q2 availability target that Microsoft called-out in their Integration Roadmap. Logic Apps is a managed service that allows customers to build lightweight integration interfaces in the cloud. It focuses on connectivity with SaaS applications including Salesforce, Office 365, Dynamics CRM and Slack. It also allows for connectivity to PaaS offerings such as Azure Service Bus, Azure Functions and on-premises platforms like SAP and SQL Server. Organizations can build Logic Apps using a modern web browser or using Visual Studio (in preview). Within a Logic App you can drag connectors onto your design canvas, use flow controls such as looping, conditions and parallelism. Your Logic Apps can then be deployed in Azure where Microsoft manages the underlying platform and runtime environment. In earlier releases of Logic Apps, tracking previous workflow instances was possible, but was very textual. As part of this release, visual run details are provided. The details captured, include execution time, on a per-activity basis, errors raised by external systems and send/receive message payloads. 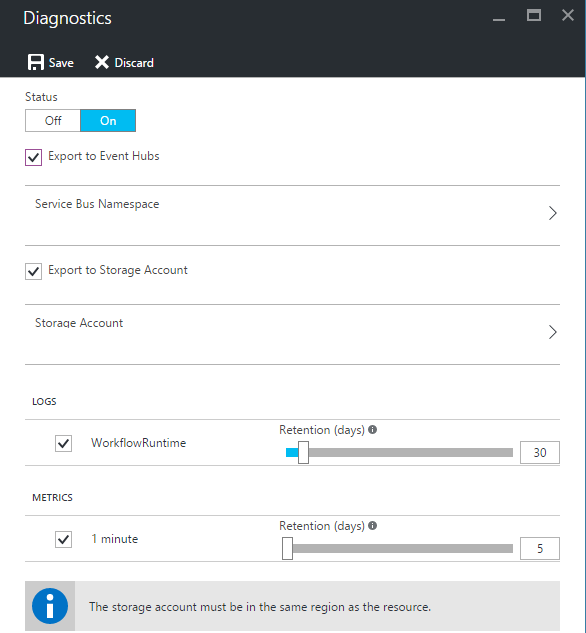 Additional diagnostics can be configured that allow developers to send telemetry to Azure Event Hubs. Once data has been published to an Event Hub, developers have many options in how this data is stored and analyzed. 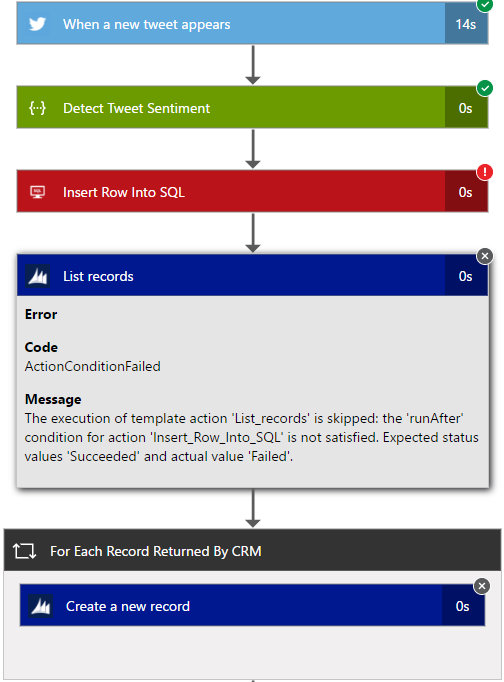 One option may be streaming this data through Azure Stream Analytics, where calculations may be performed, prior to it being published to Microsoft Power BI for trending analysis or data exploration. Another option is to have this telemetry information flow into Microsoft’s Operations Management Suite where administrators have visibility into the health of other Azure services and VMs. With telemetry events configured, developers can now configure Azure Alerts to fire when specific thresholds are exceeded. For example, in the event that a Logic App has failed, an event subscription can be created so that interested stakeholders receive an email notification. Microsoft has also announced how they will price Logic Apps. Since Logic Apps is a cloud-based service, Microsoft has priced it using a consumption model. Microsoft is basing consumption on “actions”. You can think of an action as a step within a workflow. Sending a message to Salesforce is considered an action. Using the response from Salesforce to update SQL Server is considered another action. Microsoft has also included volume tiers which allow customers to pay less, per action, based upon the number of actions they execute. For more details on pricing, please see the Azure Pricing Page. InfoQ previously included Microsoft in an iPaaS Virtual Panel and has once again reached out Jim Harrer, principal group program manager at Microsoft to gain further insight into this Logic Apps release. 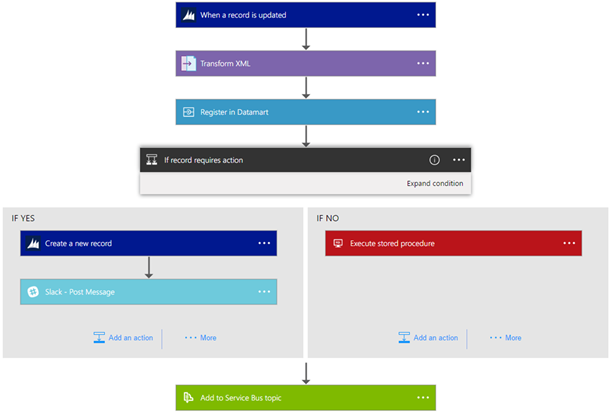 InfoQ: The Logic Apps team has been working on a lot of features in the past couple months, including Visual Studio support, visual run details in the Azure Portal, API Connector Management support, Azure Event Hub telemetry support and additional connectors. Which of these features are you most excited about and why? Jim Harrer: I’m excited about each of these features simply because it demonstrates our determination to drive new features across a wide array of enterprise integration disciplines. Visual Studio support is probably creating the most applause with our Pro Integrators at the moment, because it allows them to design, manage, and deploy their logic apps from within Visual Studio. InfoQ: Part of Microsoft's strategy is to ensure Microsoft BizTalk Server and Logic Apps inter-operate with each other. What are some scenarios you envision customers using with these two platforms? Harrer: BizTalk Server and Logic Apps “together” reinforces our hybrid strategy and opens up limitless possibilities for our enterprise customers. Triggers and Actions transcend seamlessly across SaaS and on-premises LOB applications allowing workflows to start on-premises and finish in the cloud or vice-versa. A common scenario is to integrate custom LOB applications (which often serve as systems of differentiation for our customers) and integrate them with popular SaaS offerings. For example, a Point-Of-Sale system that needs to update a SaaS-based accounting or CRM application. InfoQ: BizTalk customers are used to paying in the traditional Microsoft Enterprise Agreement model. What opportunities do you see for existing and new customers when using Logic Apps and its consumption-based pricing model? Harrer: Logic Apps new consumption-based pricing was a direct result of talking and LISTENING to our customers while we were in Preview. It was clear; customers only want to pay for what they use, on their timetable. We decided to drop all minimum monthly pricing requirements and only charge on action executions. For 90% of our Preview customers who are using about 100,000 actions per month, their total monthly spend would be $80/month. We wanted to send a clear message to CIOs, CTOs and Enterprise Architects they can affordably move their workloads to Microsoft Azure. I believe we have done just that. InfoQ: Since Logic Apps is part of the broader Azure ecosystem, your team has been very focused on having the ability to plug into other Azure services. What are some opportunities that you see where Logic Apps can take advantage of additional Azure services? Harrer: Part of our One Microsoft initiative, we’re actively working with the Program Management teams across 50+ Azure services. Azure Service Bus is very popular and widely used by our Pro Integrators. Many of our customers are taking advantage of Azure Cognitive Services for sentiment analysis, Machine Learning for predictive analytics and our Azure IoT Suite to connect, monitor and control IoT assets. However, the party has just begun. We’re also talking with the Dynamics, O365 and SharePoint teams on additional first class experiences with Logic Apps that will delight many of your readers. We have just scratched the surface of what is possible. InfoQ: With Logic Apps now in GA, what areas of the platform are your team working on next? Harrer: I have a great team of Program Managers who have accepted the responsibility for creating an Integration Platform for enterprise customers that is second to none. For the first time, BizTalk Server, Logic Apps and API Management all fall under a new team called Pro Integration. This team is responsible for Microsoft’s Enterprise Integration vision and strategy, so it isn’t just about new features for Logic Apps. It is a bigger, deeper discussion. Our immediate focus for Logic Apps is to finish up our work lighting up all of our B2B/EDI capabilities via our Enterprise Integration Pack, release more connectors and fine-tune our Visual Studio experience. BizTalk Server 2016 is in its 2nd Customer Technical Preview stage with a release planned later this year, and API Management is moving into the new Azure Portal. Things are not slowing down, in fact, you should see our velocity increase.